"What makes a Monogram Hobby Kit so special? A lot of things: careful selection of the model, exact scale, fine detail, engineered parts that fit, the finest of materials, superior workmanship, the most complete illustrated instructions and perfect packaging." 1969 catalogue from Monogram, well-known manufacturer of model kits. 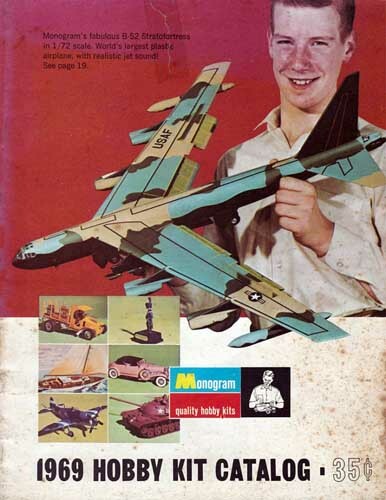 Includes listings for scale airplanes, automobiles, boats & ships, and military models. Well illustrated with colour drawings. Company history, thanks to edubarca: "Monogram Models was founded in 1945 by Bob Reader and Jack Besser. Both were working for the Comet balsa kit manufacturer when they decided to set up Monogram, starting with wooden ship kits. They later expanded to aircraft and race cars. During the early fifties Monogram began to manufacture scale model aircraft combining balsa and acetate plastic parts. They also introduced a range of flying models called Speedee-Bilt, also combining plastic and balsa parts; this line remained in production until the mid sixties. In the early fifties, Monogram started production of their first all-plastic kits, including some race cars and aircraft like the PBY Catalina, B-26 Invader and B-25 Mitchell. Always demanding the best possible quality, they continued to make beautiful kits and in the early sixties began production of the famous quarter inch scale models of WW2 fighters and other aircraft. Monogram was merged with Revell and purchased by Odyssey Products in 1986. After a few years, most of the Monogram models began to be injected and sold by Revell, and the Monogram name was almost completely dropped."